Also, I’ve spent an entire week without reading any books or talking about them too loudly. I’m learning to worship my new apparat’s screen, the colorful pulsating mosaic of it, the fact that it knows every last stinking detail about the world, whereas my books only know the minds of their authors. The analytical Lenny falls in love with the cute and somewhat vacuous 24-year-old Eunice Park while working in Italy. Eunice is a social climber and reluctantly realized that Lenny may be her only way up. She needs a place to stay so comes back from Italy and stays in Lenny’s apartment where Lenny succeeds in winning her over a bit after she’s tweaked his fashion style and looks. Eunice is from South Korea and her parents would like her to return home to New Jersey but she’d rather not. But when Eunice meets Lenny’s powerful boss Joshie, all bets are off. Lenny’s ageless boss, Joshie, gives him grief about what he eats, how much he exercises and how much time he spends under a sun lamp. Just that his boss who must be over 60, likes to be called Joshie says so much. Not many people embrace aging but in Super Sad True Love Story you easily age yourself out of any and all rights. Which isn’t all that unusual considering how our society alienates and often mistreats the elderly. This novel is not all statistics and scary futuristic ideals. It contains a lot of passion. While he feels under-appreciated by Eunice, less-than-attractive by new societal standards, Lenny remains honest, thoughtful and loyal throughout all the challenges he faces. He still holds some truly American values like the importance of great friends and familial bonds. Everyone wants to be loved. There’s zero privacy any longer in Super Sad True Love Story, —and this I must admit isn’t all that difficult to imagine when every other day Facebook announces a new plan to make us feel more exposed. Anyone can get stats on anyone else. Vast streams of information and data are amassed on every individual. And what of individuality? It’s not that easy to stand out anymore. No one reads. Books have become antiquated collector’s items and few people actually want to collect them. Lenny finds that few appreciate his Wall of Books. Shteyngart makes the reader believe in this realm of possibilities for this new existence. Aren’t we already a few clicks there already– cyber-stalking, WikiLeaks, face recognition software on Facebook, posting our locations on foursquare? 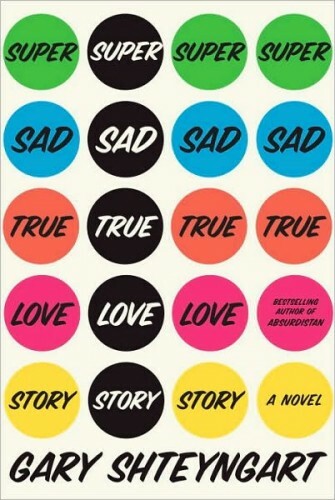 Super Sad True Love Story is remarkably clever and an ingenious futuristic novel that remains entrenched in reality. This entry was posted on December 19, 2010, 16:39 and is filed under Books. You can follow any responses to this entry through RSS 2.0. Both comments and pings are currently closed.